Last-minute reservations are still available for Mother's Day. 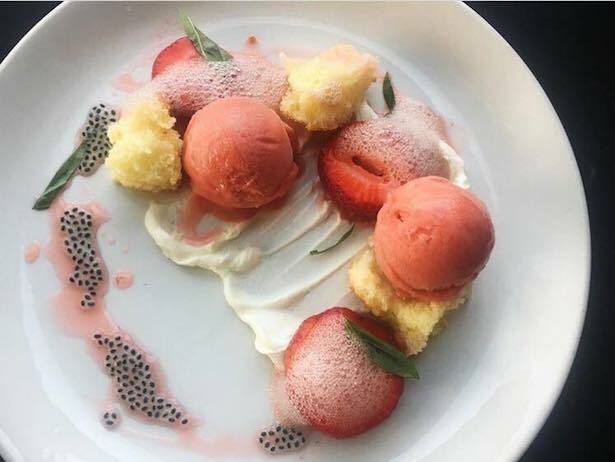 Your mom deserves this lovely Lark dessert. Capitol Hill’s Lark is offering two options for impressing a hard-to-impress mom. The first is a lesson on Saturday in seasonal bouquet composition with Hannah Morgan of Fortunate Orchard, a take-home arrangement, and a light breakfast of house-made pastries, mimosas and coffee ($120, tickets available here). Then Sunday, Lark is offering a three-part prix fixe brunch ($32) that’s already full; instead, bring her for dinner, when the regular menu is available and there are plenty of reservations to be had. Jack’s BBQ in Georgetown is finally launching their brunch menu, after rolling out their spectacular Austin-style breakfast tacos months ago, and they’re doing it on Mother’s Day. Get those tacos, plus migas, pancakes with smoked peaches, and some crazy Bloody Mary that involves pickled eggs and bacon, from 10 a.m. to 2 p.m. Reservations can be made here. The monthly Sunday suppers at Volunteer Park Café are recommended any time you can make it, but the menu for Mother’s Day is particularly delightful: asparagus salad, halibut with baby artichokes and English peas, and strawberry-rhubarb pie to finish. It’s a straight-from-the-springtime-garden meal served family-style ($45)—the kind of thing Mom will adore, and she doesn’t have to cook it. Make your reservations here. If Mom loves Japanese cuisine, you’re in luck: Eastlake’s Sushi Kappo Tamura is offering a special meal for Mother’s Day brunch: braised hijiki salad, agedashi ling cod, Washington albacore and mustard green salad, sashimi plate, ikura rice, chawanmushi, and a choice of wagyu beef konabe or kurobuta tenderloin tonkatsu, followed by a choice of yuzu panna cotta, chestnut creme brûlée or millet mochi with azuki red beans ($55). Only a few slots are left, so book them here. Take Mom out on Saturday to the South Lake Union market for a fun assortment of indie arts and awesome food items—particularly this week, since there’s a food truck roundup. On Sunday, their sister market in Fremont will have it’s usual lineup of quirky vintage vendors and food trucks. If your mom is anything like mine, head to the Nosh truck for fish ‘n’ chips. Treat mom to a sweet at Cupcake Royale on Sunday, when all six locations will be offering a special MOMosa cupcake (champagne cake, blood orange buttercream frosting, topped off with candied orange peel). Buy one for her, and you’ll get one for yourself free. I recommend going to the Capitol Hill location, so you can also check out the delightful Food Art Collection exhibit (up through June 4).